Get ready to eat, pray and love – this thatched roof villa embodies the Balinese feel of Ubud. Few villas can compete with this five bedroom villa Omah Padi, that accommodates ten people, set amidst the verdant green rice fields of Ubud famed for its beauty and being the center of Balinese culture. True to its reputation, it sports a typical open space living structure seen in the handsome bamboo and timber frame-rugged, tough and holistically engrained with the real Balinese style of living. The five bedrooms come with their air-conditioned comfort gorgeously decorated with handcrafted furniture, soft linen in natural fibers and a view of the paddy fields and the estate lawns all around. The pool marks another spectacular part of the villa with its deep blue tiling that glows in all its glory as the night sets, the water looks all the more temptingly aquamarine. The comforts of the villa include the kitchen with all possible cooking equipments that would help your gastronomic talents surface as you conjure up some great recipes with the help of the maids. Do indulge in some meditation or yoga out on the lawns as the sun rises and breathe in the freshness all around. Share a sumptuous breakfast together with your family in the beautiful dining space that has adequate seating for all. Spend the day in the salubrious outdoors, floating in the private pool and cooling off in the air-conditioned interiors perhaps watching a movie with your children or listening to music till sunset. 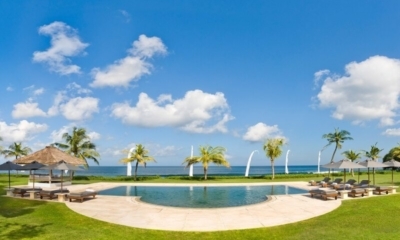 There are umpteen ways in which the natural setting of this villa will enthrall you. Ubud is a town nestled deep in the bosom of the island of the gods. If any place can be called the heart of Bali, then surely Ubud is that place. Maybe it’s the rolling green hills and luscious forests that surround the valley, maybe it’s the breathtaking temples that dot across the landscape, or the serenity of the locals as they go about their business, whatever it is, something marks Ubud as being a very special place indeed.